Biography and Paintings of German-American Landscape Painter. For more, see: American Art. The German-American artist Albert Bierstadt was famous for his large-size landscape painting of Western American wilderness scenery. His subjects included American national parks, scenic reserves, lakes, glaciers and wild animals. Along with Frederic Edwin Church (1826-1900), Bierstadt was a well-known figure in the 19th-century Hudson River School of Romantic view-painters, and - together with Missouri man George Caleb Bingham (1811-1879) and others - a member of the later style known as Luminism. In addition, he was a member of the Rocky Mountain School of painters, who specialized in grandiose mountain scenery. His pictures were highly popular during his time, and sold for huge sums. Bierstadt later returned to Europe to study and develop his drawing and painting techniques, but it was in his adopted country of America that he found his true inspiration - the frontier landscapes of the Wild West. Works by Bierstadt can be found in the Art Institute of Chicago, the Metropolitan Museum of Art and the Museum of Fine Arts, Boston. His most famous paintings include The Rocky Mountains (1863, Metropolitan Museum of Art, New York) and Domes of Yosemite (1867, St Johnsbury Athenaeum, St. Johnsbury, Vermont). Born in Solingen, Germany, Bierstadt's parents immigrated to America in 1932, settling in New Bedford, Massachusetts. Little is known of his early life, except that between 1853 and 1857 he returned to Germany to study with the Dusseldorf School of Painters. This was a group of painters who taught or studied at the Dusseldorf Academy and were part of the German Romanticism movement. Their work was characterised by detailed but flamboyant landscapes, often with religious overtures. Leading members of the school advocated the use of plein air painting, and tended to choose sombre, subdued colours for their palette. Prominent members of the school included Karl Friedrich Lessing (1808-80), Johann Wilhelm Schirmer (1807-63), Andreas Achenbach (1815-1910), and Hans Fredrik Gude (1825-1903). The Dusseldorf School also had an influence on its American counterpart the Hudson River School, which had been set up earlier by Thomas Cole (18011848). On arrival in Germany, Bierstadt sought out the acquaintance of two fellow American painters, Worthington Whittredge (1820-1910) and Emanuel Gottlieb Leutze (1816-68). He hoped they would convince Achenbach to take him on as a student. However, Bierstadt's works were judged to be of such low quality, that the expats told him that Achenbach did not take on students. Undeterred, Bierstadt remained in Europe for four years, devoting himself to the study of his art, travelling to many places including Italy and France. Bierstadt returned to America in 1857 where he taught drawing and painting for a brief period, before devoting himself entirely to his own art. Initially he focused on creating landscapes based on European scenes, but in 1859 he travelled westwards, drawing and sketching scenes which would provide the basis of many future paintings. 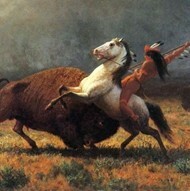 He travelled to the Platte River and Wind River Mountains, sketching the breathtaking scenery and native inhabitants. He progressed to the Rockies, where the views reminded him of the Alps back in Europe and the light of Italy. So enthusiastic was the young artist that he declared that 'Our own country has the best material for the artist in the world'. His first important painting from this period, now lost, was Base of the Rocky Mountains (c.1860). His 1863 version, The Rocky Mountains can be seen at the Metropolitan Museum of Art, New York. Back in cosmopolitan New York, Bierstadt's fame began to grow when his Rocky Mountains was displayed opposite a work by the highly respected landscape artist Frederic Edwin Church (1826-1900) at the 1864 New York Sanitary Fair. It led the art critic James Jackson Jarves to state that Bierstadt's painting displayed an unsurpassed rendition of American light. A decade of success followed, during which his painting Rocky Mountains sold for $25,000 - as also did his Domes of Yosemite (1867, St Johnsbury Athenaeum, St. Johnsbury, Vermont). Domes of Yosemite depicts one of America's most popular natural wonders, that of the mountain peaks of the Yosemite valley. In 1864 Abraham Lincoln officially granted the Yosemite Valley to the State of California, creating America's first official public land trust in history. The financier Legrand Lockwood commissioned Bierstadt to create the work, paying the astronomical fee of $25,000. This was a period of self-discovery in America, where people started to realise that their landscape was as good, if not better, than anything in Europe. Artists and photographers, travelling with governmental survey expeditions, captured images which fired the imagination of the general public. Paintings by Bierstadt and others - including the Missouri frontier painter George Caleb Bingham (1811-1879) - offered city dwellers an unrivalled experience of their country's natural grandeur, as did the later 'Wild West' illustrations by Frederic Remington (1861-1909). In Domes of Yosemite, Bierstadt enhanced the natural scene by narrowing the valley and dramatically accentuating the heights of the mountains. In such a way he was evoking gothic architecture and the soaring heights of a medieval cathedral's central nave. Another beautiful example from this period is Mountain Brook (1863, Art Institute, Chicago). In 1866 Bierstadt married and the newly weds spent two years travelling around Europe. They were treated with acclaim: in London they met Queen Victoria and in Paris he was awarded the Legion of Honour. While in Rome they met the renowned composer Franz Liszt. During his travels Bierstadt rented studios and continued to produce finished works on Western scenery. In 1870 he returned to America, but in 1871 again headed west to the Yosemite and Sierra Nevada region. He stayed two years, sketching, painting and selling works to collectors in the San Francisco area. Unfortunately, during the 1870s, grandiose landscapes fell out of favour in America - cf. the Tonalist landscape painting of George Inness - and Bierstadt's star began to fade among fellow artists and art critics. His work for the 1876 Philadelphia Centennial was not well received. Then, his painting Last of the Buffalo (c.1889, Corcoran Gallery of Art, Washington DC) was rejected for the 1889 Paris Universal Exposition. Despite this, his paintings continued to find popularity with sectors of the public, still fetching high prices. During the 1870s Bierstadt spent time in the Bahamas sketching, primarily for the improvement of his wife's declining health. His wife died in 1893 and the following year he promptly married a wealthy widow. Despite his success and new bride, Bierstadt's extravagant lifestyle led him into debt. In 1895 his entire property and assets, including 150 paintings, were sold to satisfy his creditors. He died suddenly in 1902. Bierstadt was a member of the National Academy of Design from 1860 until his death, and was a member of the Century Association (an exclusive club of authors and artists). Highly prolific during his career, he produced thousands of paintings during his lifetime. Many of these hang in the best art museums in America, like Smithsonian American Art Museum, Washington DC, and are available today as popular commercial poster prints. In 1998 the US Postal Service issued a set of commemorative stamps entitled Four Centuries of American Art, and one of those stamps contained the image of Bierstadt. 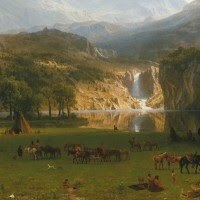 At Christie's auction house in 2009, his painting Oregon Trail sold for $1.7 million and his Mountainous Landscape by Moonlight fetched $1.1 million. Note: For 20th century American landscape painters, see the Iowan artist Grant Wood (1892-1942) and the Pennsylvanian Andrew Wyeth (1917-2009).